UNCLE PETE – MIDV (MISSING IN DARK VAULT) – AND GIANT SEAFOOD TOO!!! Seems like lately, we can’t swing a dead cat (or whatever that thing is El Vato’s been swinging) without hitting an alien of one sort or another. A few weeks ago, they knocked us off the air. Last week they fought with Starman and managed to invade the DARK VAULT. Wherever they’re from, one thing’s certain – there’s been an explosion in THE DARK VAULT OF PUBLIC DOMAIN. And last time we saw UNCLE PETE, he was high-tailing it out of a soon to explode DARK VAULT. 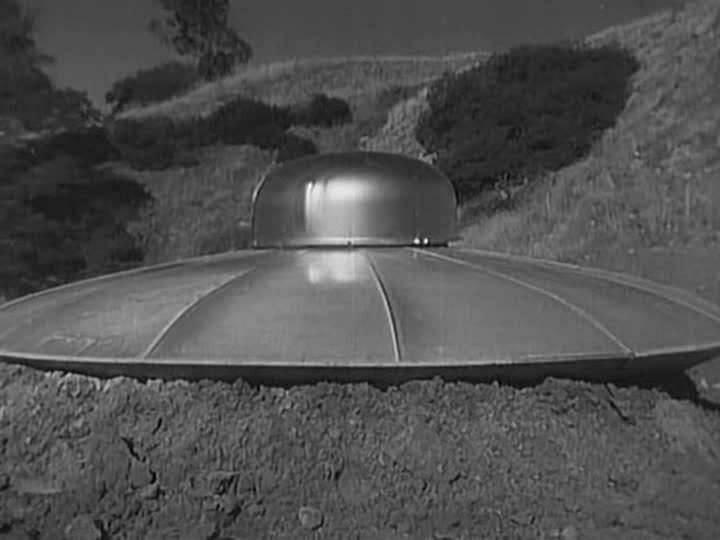 But major explosions and a host who may have been blown into orbit have never prevented the show from going on,so tune in this week for a tale of juvenile delinquents from out there – Teenagers From Outer Space! A way out space hot rod lands on earth filled with aliens looking for a planet suitable for raising their food – giant lobster-like creatures called gargons. The aliens start out pretty unfriendly when they vaporize a happy dog to nothing but bones and license tag, from which we find out his name is Sparky. Derek (David Love), one of the aliens, finds the tag and realizes that the planet is inhabited and raising gargons here will pose a hazard to the natives (namely us earthlings). Thor (Bryan Grant) and the rest of the aliens don’t care, so Derek heads to town where he meets Betty Morgan (Dawn Anderson) and her Gramps (Harvey B. Dunn) and warns them of the impending doom. When townsfolk start getting chomped by gargons, people start to investigate, including Betty’s sorta boyfriend before Derek showed up, Joe Rogers (Tom Lockyear). So tune in this Saturday, May 2, 2015 from 10PM to midnight on channel 4 in the Binghamton area, channel 99 (Elmira/Corning/Hornell), and channel 17 (Sayre and around there in PA) and remember, we have encore presentations at midnight and 2AM. It’s Teenagers From Outer Space, the next feature presentation with UNCLE PETE (somewhere) on THE DARK VAULT OF PUBLIC DOMAIN! ~ by UNCLE PETE on May 1, 2015.